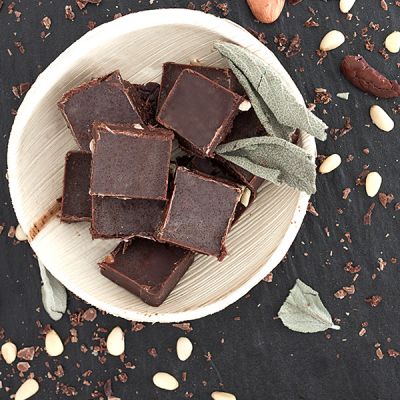 Sweet-savoury chocolate creation with intense sage leaves and crisp cedar nuts. Melt the cocoa butter. Sieve the cocoa and stir together with cocoa butter and agave syrup. Mince sage leaves and cedar nuts. Mix everything. Enjoy every moment. Fill the chocolate into little moulds, make sure it is about 5 mm thick and leave it to cool. Break into pieces and serve. Made with love. Lifefood tip : if you can't find cedar nuts, you can substitute regular pine nuts.